Cherry blossoms aren't the only reason spring is one of the best seasons in Japan! As the country shakes off the winter chill, many other lovely flowers bloom as well, including the bright yellow nanohana (canola blossoms). Here's a list of 30 spectacular gardens throughout the country, brought to you by our friends at Trip101. Takikawa is a city conveniently located between Asahikawa and Sapporo—two very popular tourist spots in Hokkaido Prefecture. By car it's 40 minutes from Asahikawa or 1 hour from Sapporo. 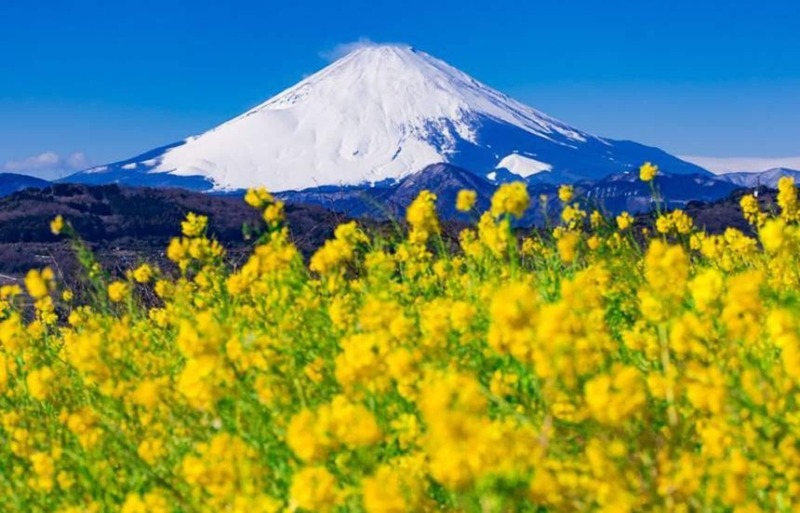 Takikawa is known for having the biggest canola (nanohana in Japanese) plantation in Japan, with an unbelievable 180 hectare (445 acres) in total. When the flowers bloom in spring, the Takikawa Nanohana Festival attracts tourists from all over the world. Various snacks and products made from canola are also available, and make great souvenirs for your family and friends! Located in the city of Osaki in Miyagi Prefecture, Himawari-no-Oka (literally "sunflower hill") contains over 420,000 sunflowers (or himawari) over an area of 6 hectares (15 acres). In summer they celebrate a Sunflower Festival which typically opens mid-August, and in spring both nanohana and sakura bloom to create an incredible scene of yellow and pink! Located at the southern end of Kyushu, the warmer climate of the city of Ibusuki in Kagoshima Prefecture allows beautiful flowers to bloom as early as December through February! These flowers can be appreciated in one of the marvelous onsen hot springs around nearby Lake Ikeda along with a view of the volcano, Kaimondake, rising in the distance. Nara Prefecture is famous for its many UNESCO World Heritage Sites. Among them is the village of Asuka-Fujiwara, which has many ancient archaeological sites. In spring sakura and nanohana burst into bloom. It's a popular spot for visitors to rent bicycles, and enjoy both the beauty of nature and Japan's enduring history. Daiichi Nagisa Park is in Moriyama City in Shiga Prefecture. While it's famous for its large nanohana garden— packed with over 12,000 flowers—it's also quite close to Lake Biwa, Japan's largest lake. The nearby mountains make this park a photographer's dream! Looking for even more beautiful gardens? Read the full article at Trip101 via the link below!